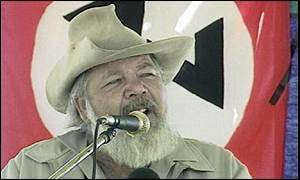 Eugène Ney Terre'Blanche ,31 January 1944-3 April 2010, was a former member of South Africa's Herstigte Nasionale Party who founded the Afrikaner Weerstandsbeweging (AWB) during the apartheid era. 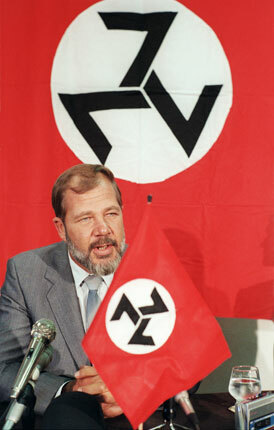 During the 1980s and early 1990s, he became known for threatening civil war to maintain white rule in South Africa. 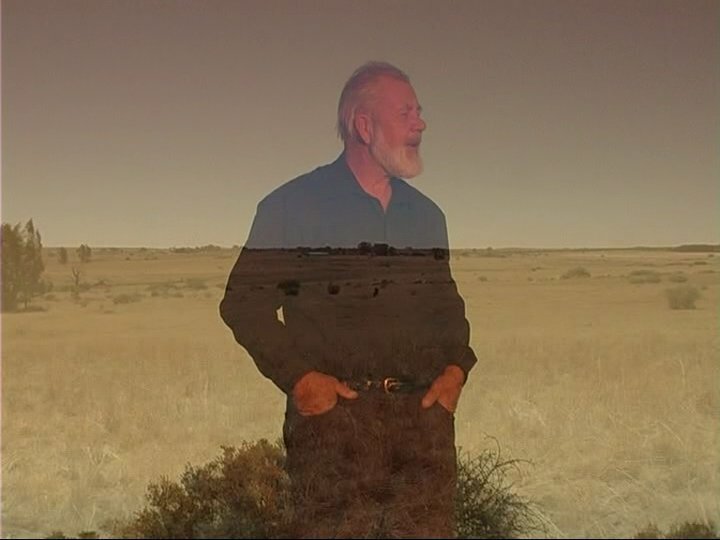 After the country's transition to post-apartheid democracy, he revised his stances and urged his followers to push for independence in an independent Afrikaner homeland, which he frequently referred to as a "Boerevolkstaat". 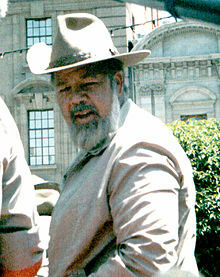 Terre'Blanche led the organisation until his death in 2010. 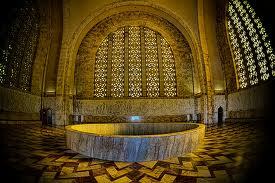 He was given several labels during his lifetime, including "white supremacist", "nationalist," and "racist". 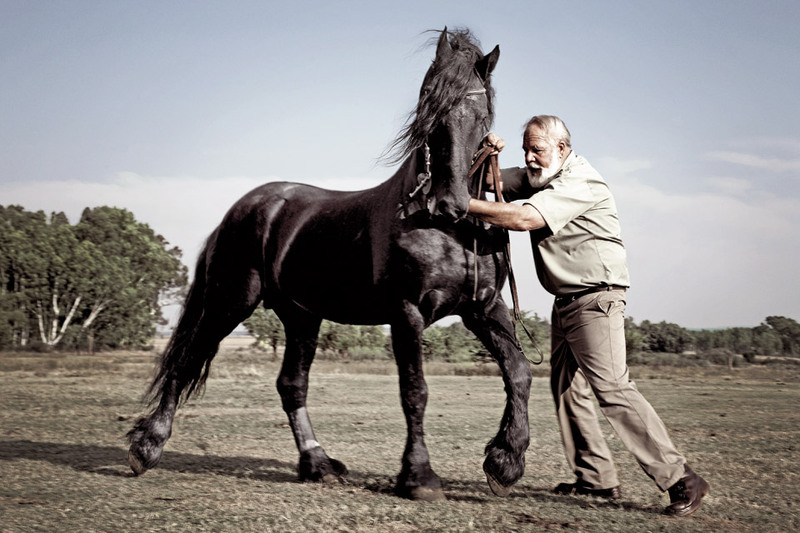 Terre'Blanche spent three years in prison for assaulting a black petrol station worker and for the attempted murder of a black security guard in 1996. 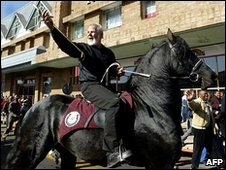 On 3 April 2010, he was hacked and beaten to death on his farm by a black farm labourer, allegedly over a wage dispute. 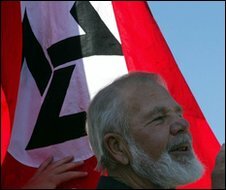 Terre'Blanche's supporters have said that the murder is part of a larger pattern of anti-white farm murders in South Africa. 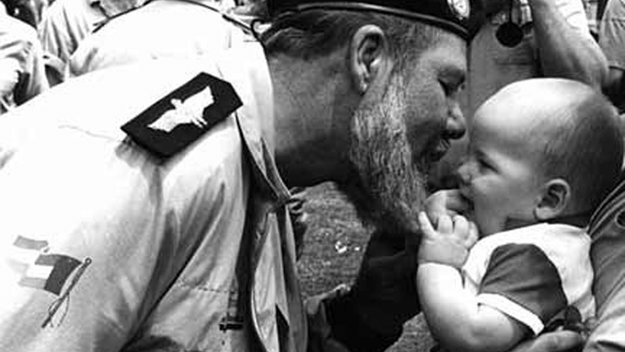 Terre'Blanche's grandfather fought as a so-called "Cape Rebel" for the Boer cause in the Second Boer War, and his father was a lieutenant colonel in the South African Defence Force. The progenitor of the Terre'Blanche name (translatable as either 'white land' or 'white earth' in French) in the region was a French Huguenot refugee, Estienne Terreblanche from Toulon (Provence), who arrived at the Cape in 1704, fleeing anti-Protestant persecution in France. The Terreblanche name has generally retained its original spelling though other spellings include Terre'Blanche, Terre Blanche, Terblanche and Terblans. He joined the South African Police, and was initially deployed in South West Africa (now Namibia), which had been given to South Africa under a League of Nations Trust mandate after World War I. Upon returning to South Africa proper, he became a Warrant Officer in the Special Guard Unit, which was assigned to members of the Cabinet. 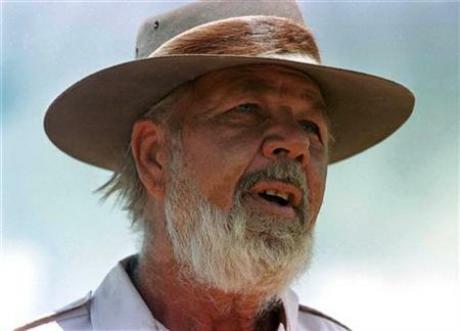 During the late 1960s, Terre'Blanche increasingly opposed what he called the "liberal policies" of B. J. Vorster, then Prime Minister of South Africa. After four years of service in the SAP, he resigned to pursue a career in politics, running unsuccessfully for local office in Heidelberg as a member of the Herstigte Nasionale Party. 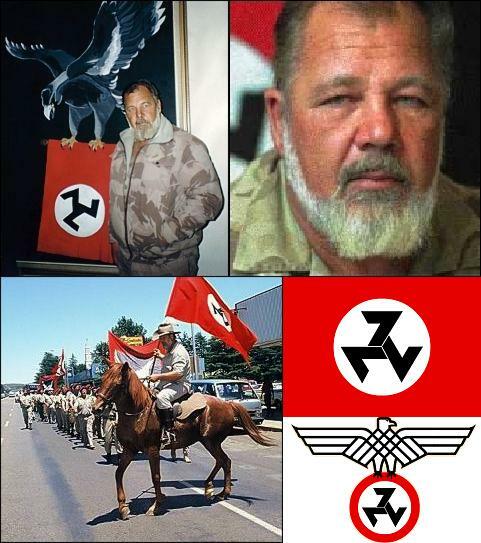 Disillusioned with the established avenues for political participation, Terre'Blanche founded the Afrikaner Weerstandsbeweging (Afrikaner Resistance Movement, AWB) in Heidelberg in 1973, initially as a secret society. 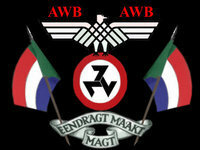 The AWB first appeared on the public scene after its members were charged with and fined for tarring and feathering Floors van Jaarsfeld, a professor of history who had publicly voiced the opinion that the Day of the Vow (previously called Dingaan's Day), a public holiday in remembrance of the Battle of Blood River, was nothing more than a secular event with hardly any real reference point in history.Though Terre’Blanche would later express his regrets regarding the incident when testifying before the Truth and Reconciliation Commission, he suggested that his convictions relating to the sanctity of the Day of the Vow might make his actions more understandable.In the years that followed, Terre'Blanche's speeches at public gatherings often evoked the Battle of Blood River,and his oratorical skills earned him much support among the white right wing in South Africa; the AWB claimed 70,000 members at its height.Throughout the 1980s, Terre'Blanche continued to present himself and the AWB as an alternative to both the National Party-led government and the Conservative Party, and he remained staunchly opposed to the reform policies of PW Botha to establish additional, albeit still separate, parliamentary chambers for non-whites, and to grant suffrage to Coloureds and South Africans of Indian origin. 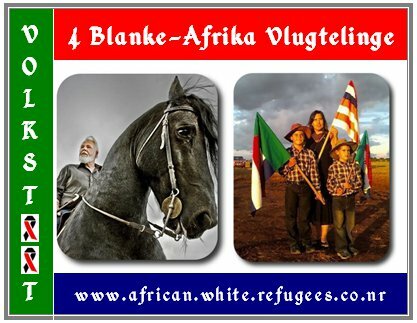 The organisation's strongest support was found in the rural communities of South Africa's North, with comparably few supporters in urban areas where his following was largely limited to the middle and lower income Afrikaners. 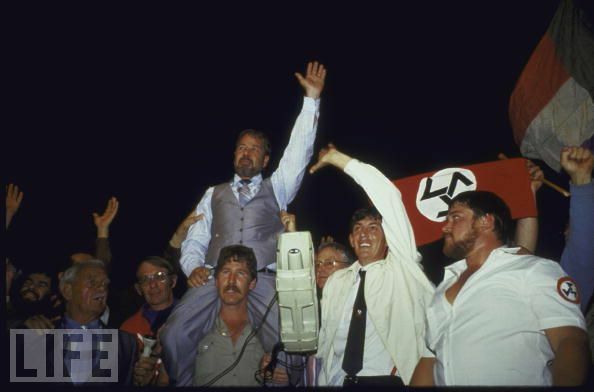 Terre'Blanche viewed the end of apartheid as a surrender to communism, and threatened full scale civil war if President FW de Klerk handed power to Nelson Mandela and the African National Congress. 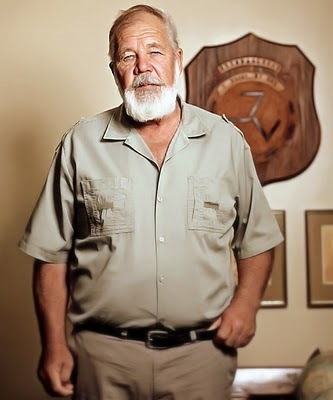 When De Klerk addressed a meeting in Terre'Blanche's hometown of Ventersdorp in 1991, Terre'Blanche led a protest, and the Battle of Ventersdorp ensued between the AWB and the police, with a number of people killed.Terre’Blanche claimed that it was only when he stood between the police and the AWB and demanded a ceasefire that the shooting ended. Terre'Blanche accused President de Klerk of instigating the riot for political gain. 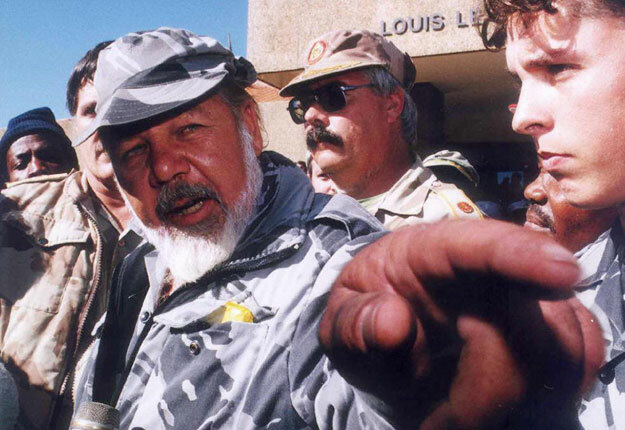 In an attempt to disrupt the negotiation process in 1993, Terre'Blanche accompanied by General Constand Viljoen and Conservative Party parliamentarian Thomas Langley led an armed invasion of the World Trade Centre in Kempton Park while negotiations were in progress. After a memorandum of grievances were presented to National Party minister Roelf Meyer and Dawie de Villiers and upon concluding and agreement that no arrests would be made, the AWB withdrew from the premises. However that evening several identified AWB leaders were arrested and their wives were incarcerated in Soweto, separately from their husbands. Vlakplaas General Krappies Engelbrecht was appointed to launch an investigation. Terre'Blanche claimed he and President Lucas Mangope of the predominantly ethnic Tswana Homeland of Bophuthatswana came to a “mutual agreement” on 17 February 1992, to aid each other in the “event of a communist threat” On 4 March 1994 Mangope announced that Bophutatswana would not participate in the South African general election in an effort to maintain Bophutatswana's independence from the Republic of South Africa. Bophuthatswana's minister of justice, Godfrey Mothibe tried in vain to convince Mangope to participate in the election, but then accused the ANC of orchestrating the revolt, which was helped by the stance taken by South Africa's then Minister of Foreign Affairs, Roelof "Pik" Botha. 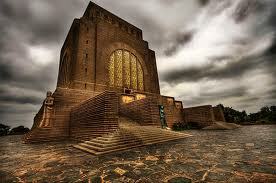 Thousands of ANC supporters were bussed in from areas outside of Bophuthatswana to support the popular uprising. Terre'Blanche claimed a conspiracy by citing a “three-step plan” by the ANC in an effort to destabilise Bophuthatswana, which included ANC infiltration of the Bophuthatswana police and military. However, ANC candidate for the North West Province, Popo Molefe claimed the ANC was merely supporting the people of Bophuthatswana after it became clear that their political freedoms were limited. 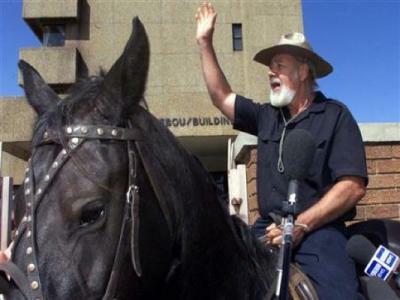 Terre'Blanche claimed he had personally communicated with Mangope on 10 March 1994 , prior to mobilising his men to protect the capital Mmabatho against looting and unrest. 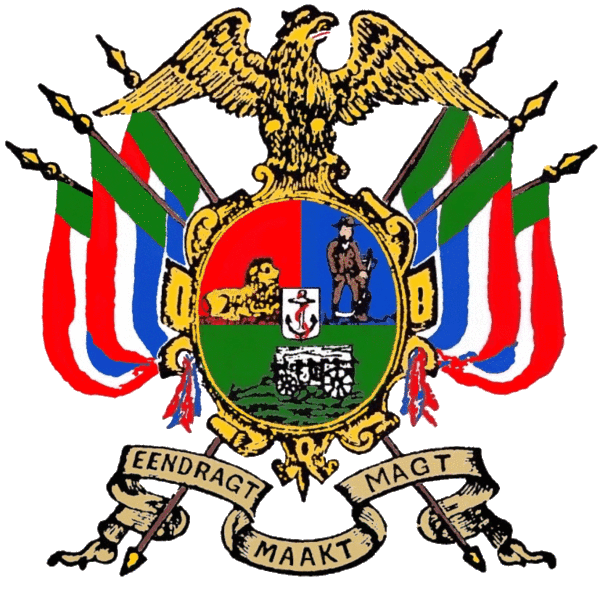 Officers of the Bophuthatswana Defence Force initially received the AWB militia with “great joy and surprise.” (Vuur en Verraad, Arthur Kemp) The AWB militia assembled in an airport hangar in Mmabatho, where they were to be provided with rations and firearms. 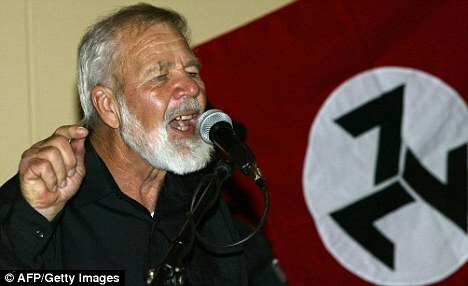 Terre'Blanche ordered his men to remove their AWB badges upon the request of the Bophuthatswana Defence Force. 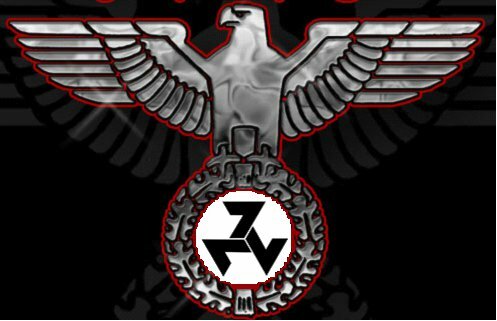 While contained at the hangar, an unidentified and independent faction carrying the AWB emblems started shooting indiscriminately at the public. 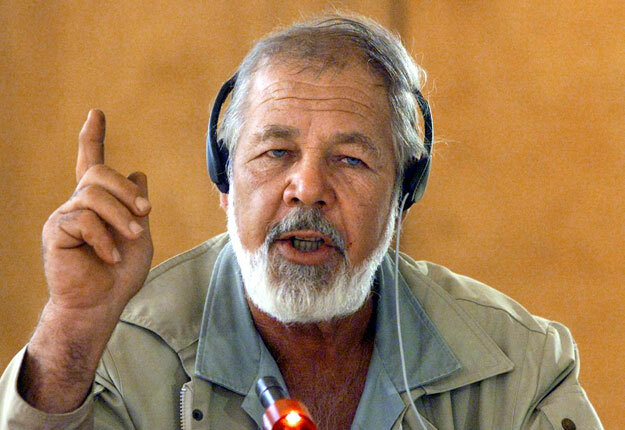 Terre'Blanche concluded that the South African intelligence services may have set up the shooting in order to discredit the AWB, since the media broadcast footage of the individuals' emblems, but did not publicise their identity. 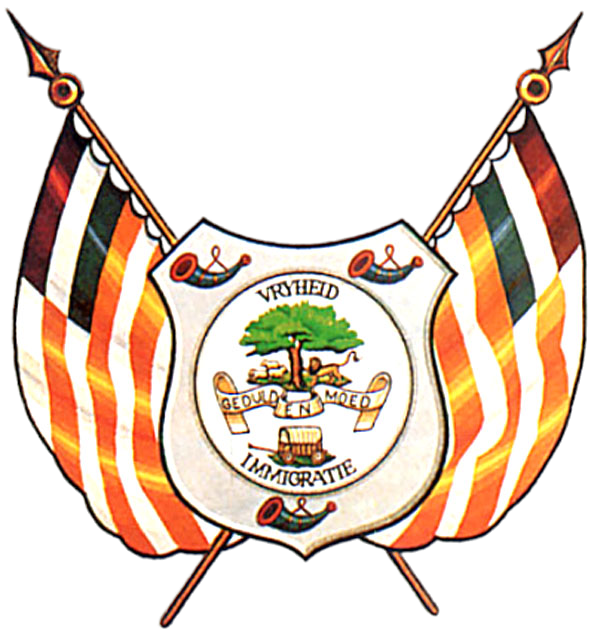 The Bophuthatswana police systematically began to remove the media from strategic locations, and the initial hospitality shown to the AWB militia was replaced by contempt. 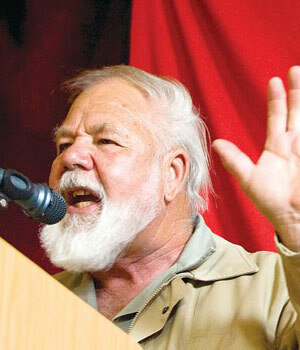 When Bophuthatswana fell into complete anarchy, the AWB withdrew.The AWB were subsequently defeated while invading Bophuthatswana to prop up the autocratic leader of the bantustan in 1994 and, consequently, Terre'Blanche did not follow up on his earlier threats of war. Terre'Blanche was lampooned in the 1991 documentary The Leader, His Driver and the Driver's Wife, directed by British filmmaker Nick Broomfield. A sequel, His Big White Self, was first broadcast in February 2006. Terre'Blanche was also interviewed by Louis Theroux in episode 3.3 "Boer Separatists" of the BBC series Louis Theroux's Weird Weekends.In 1988, the AWB was beset by scandal when claims of an affair with journalist Jani Allan surfaced. In July 1989, Cornelius Lottering, a member of the breakaway Orde van die Dood group, orchestrated a failed assassination attempt on Allan's life by placing a bomb outside her Sandton apartment. 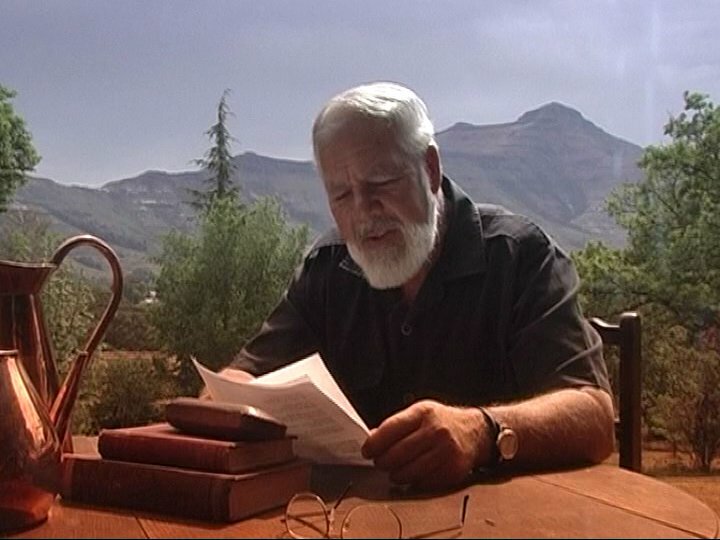 Broomfield's 1991 documentary claimed Terre'Blanche had an affair with the Sunday Times journalist; a claim she denied as well as her portrayal in the documentary. This led to Allan taking libel proceedings against the documentary broadcaster Channel 4 in 1992 in the London High Court. During the trial, several transcripts of their alleged sexual relationship appeared in the South African and British press. Terre'Blanche submitted a sworn statement to the London court denying he had had an affair with Allan. 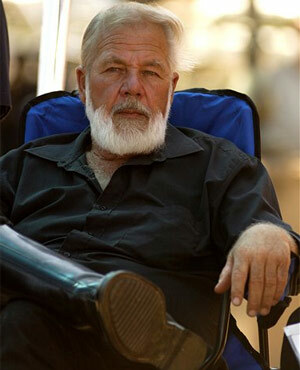 In a rare interview with the Afrikaans Sunday newspaper Die Rapport, his wife Martie Terre'Blanche denounced the rumours. 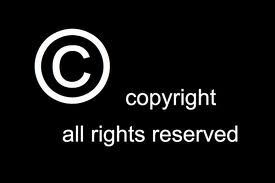 Although the judge found that Channel 4's allegations had not defamed Allan, he did not rule on whether or not there had been an affair.The South African business newspaper Financial Mail published a lead story on 6 August detailing the theory that F.W. 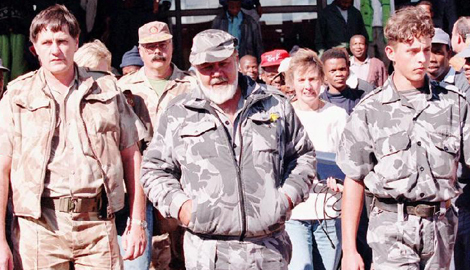 de Klerk had orchestrated the libel case to discredit Terre'Blanche and the far right movement in South Africa. In March 2008, the AWB announced the re-activation of the political party, for 'populist' reasons, citing the encouragement of the public. Reasons for the return have been attributed principally to attacks on commercial farmers and ethnic Boers, the electricity crisis, corruption across government departments and rampant crime. 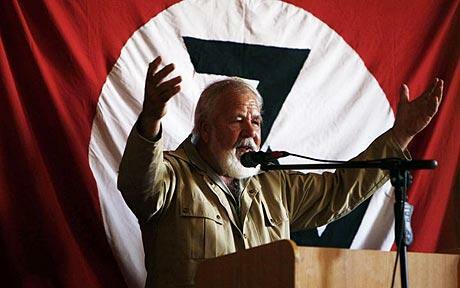 Throughout April 2008, Terre'Blanche was to be the speaker at several AWB rallies, encompassing Vryburg, Middelburg, Mpumalanga and Pretoria.He had been calling for a “free Afrikaner republic”, and vowed to take his campaign to the United Nations' International Court of Justice in The Hague in a bid to secure this. 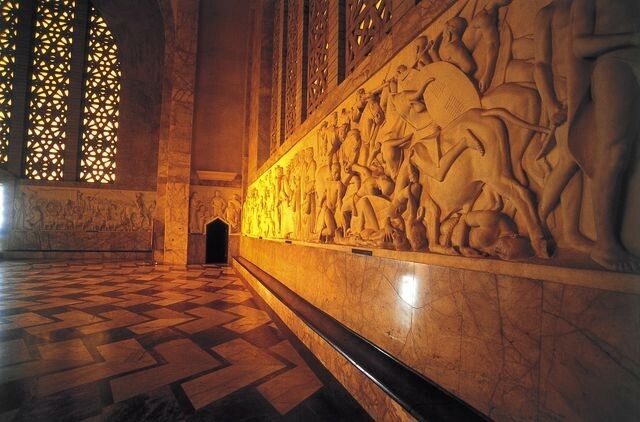 He favoured large tracks of land that had been purchased from the ethnic Swazis in the eastern portion of the South African Republic, from the Zulus in northern Natal, and others, as well as largely uninhabited portions of the interior that had been settled by the Voortrekkers. 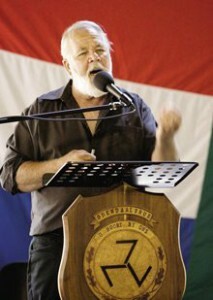 In June 2008, it was announced that the AWB Youth Wing would be launched and Terre'Blanche was to be its founding member. 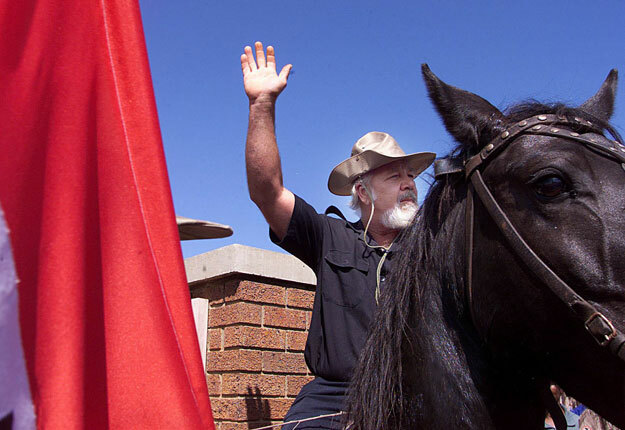 On 17 June 2001, Terre'Blanche was sentenced to six years in prison, of which he served three years, for assaulting John Ndzima, a petrol station worker, and the attempted murder of a security guard in 1996. The assault on the petrol station worker was retribution for testifying that two white boys had broken into a pharmacy. 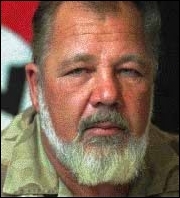 Terre'Blanche denied both accusations and insisted on his innocence.One of only three whites in the Rooigrond prison near Mafikeng, during his time in prison he claimed to have become a born-again Christian He claimed to have moderated many of his more racist views. 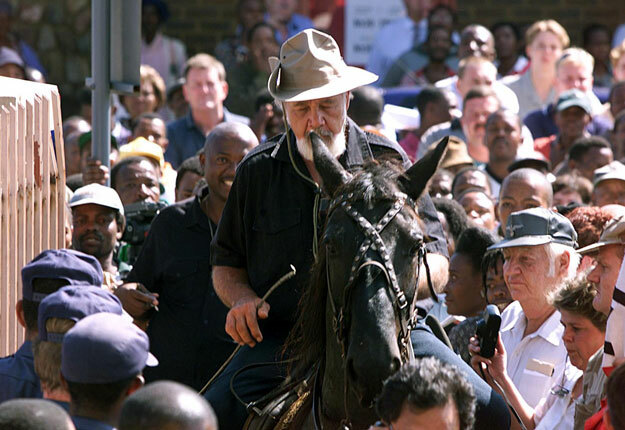 Terre'Blanche was released on 11 June 2004 and the AWB website claims these court cases and other scandals involving him were fabricated by the "Black Government and the left wing media".Paul Motshabi was permanently disabled when he was beaten up by Terre'Blanche in 1996. He was crippled and intellectually impaired by brain damage sustained in the attack, and his wife left him. 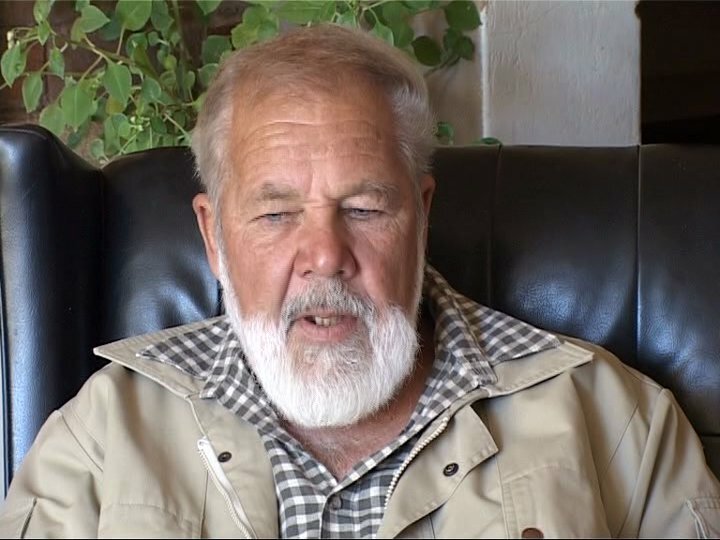 He was one of 16 victims of violence in the South Africa's North West who received new houses as part of the national government's campaign to mark sixteen days of activism against violence against women and children.Terre'Blanche continued to maintain his innocence in the Motshabi case, citing that he had discovered Motshabi already beaten when he found him in a park while patrolling Ventersdorp after which he took him to the hospital. Although he was not present when the alleged attack happened, Gabriel Kgosimang, an ex-employee of Terre'Blanche, testified that his former employer had repeatedly beaten Motshabi over the head, upper body, neck and shoulders after he crashed into him with his vehicle. The official medical report only cites a single hit to the head. 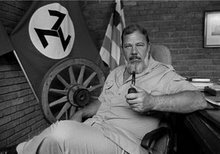 Twelve years later a policeman revealed that it had not been Terre'Blanche who had attacked Motshabi, and disclosed the names of the two culprits. Terre'Blanche claimed he feared the same powers that were active at Vlakplaas and chose not to make their names public. However, he stated that the identity of the attackers were contained in a sealed envelope and kept in safekeeping and that instructions were given that this information would be released in case something “unnatural” should happen to him. These names have not yet been released despite the murder of Terre'Blanche. 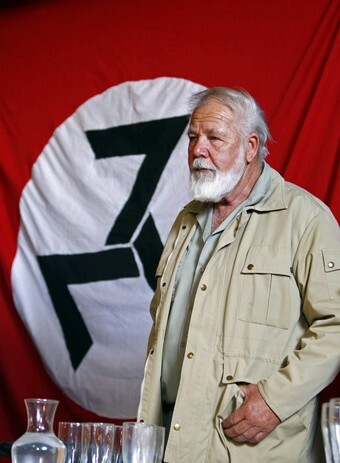 Terre'Blanche claimed innocence in the case of John Ndizima, suggesting a bogus case had been built against him in order to “bury the conservative element of Afrikaner-nationalism in the shallow grave of injustice”. 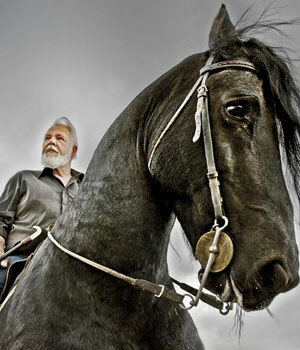 Terre'Blanche, who had lived in relative obscurity since the collapse of his organisation, was murdered on his farm Villana, just outside Ventersdorp, on 3 April 2010. He was reportedly beaten to death with pipes and pangas (machetes), while napping, by two black males (then aged 28 and 15), allegedly over a wage dispute. His daughter Bea told the media that the two workers had not been paid for March because her father could not get his banking in order before the Easter weekend, and that an arrangement had been made to pay them after the weekend. She stated that he had enjoyed a good relationship with his employees, which had been strengthened by their work with animals on the farm. His body was found on the bed with facial and head injuries. Speculation that Terre'Blanche had sexually assaulted one or both of the accused was raised in some publications. Ventersdorp police said two suspects were taken into custody over his killing; they were both charged with murder, and one was released on bail. South African President Jacob Zuma, who followed up an overnight statement with a televised address called for calm and for "responsible leadership"following the murder, describing it as a "terrible deed;" and described the murderer as "cowardly. 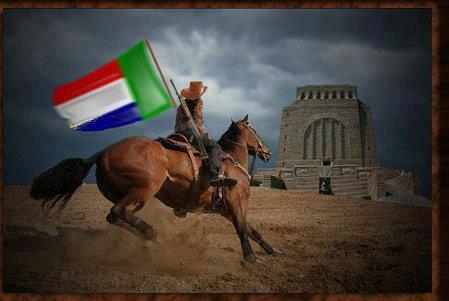 "Zuma's words were echoed by the AWB and organisations including AfriForum and Solidarity. Minister of Police Nathi Mthethwa Commissioner of police, Bheki Cele and other high ranking police officials, and politicians visited Terre'Blanche's family in Ventersdorp the morning after the murder to express sympathy with the family. The murder took place amid a racial controversy in South Africa involving the singing of a song by African National Congress Youth League leader Julius Malema which includes the lyrics "Shoot the Boer" ("Dubul' ibhunu").The ANC, which had previously defended its right to sing the song, announced that it would consider a moratorium on the singing of the song, following the murder, in the interests of national cohesion. Democratic Alliance leader Helen Zille said that the murder would "inflame tensions" in South Africa. 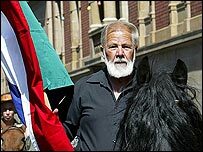 Malema denied the song had anything to do with the murder, and defended his singing of it, saying he was "ready to die," and that he was "not scared of Boers, in reference to threats, later retracted, that Terre'Blanche would be avenged. 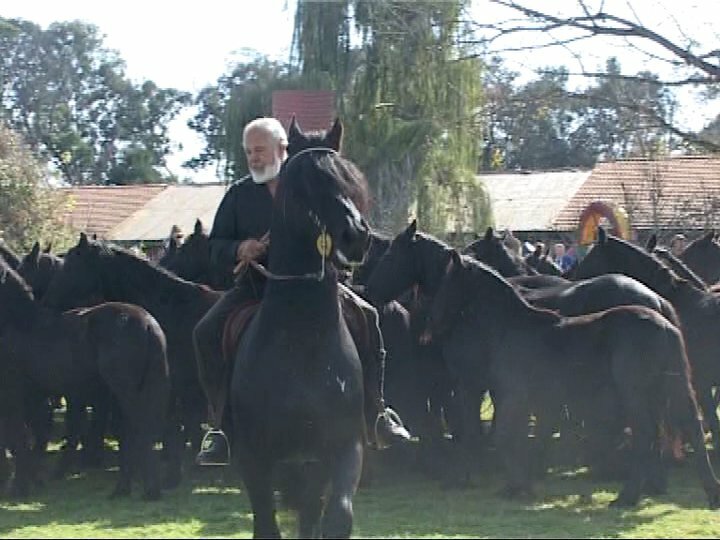 ANC leaders later announced a temporary ban on the singing of the song.Thousands attended Terre'Blanche's funeral, held at noon on 9 April 2010 at Ventersdorp's Protestant Church. Later the same day, he was buried on his farm.